There are three different form of benzodiazepines. The ultra short acting benzodiazepine (triazolam, temazepam and midazolam), the short acting benzodiazepine ( oxazepam, lorazepam and alprazolam) which carries a serious complication and long acting benzodiazepine ( clorazepate, flurazepam, clonazepam, chlordiazepoxide and diazepam). The symptoms and signs of benzodiazepine overdose are initial presentation of agitation and excitation, dysarthria, ataxia, hyporeflexia, weakness, nystagmus, confusion, drowsiness, coma, respiratory depression, constricted pupil and mid position pupil. The incidence of benzodiazepine overdose is common. However the rate of mortality is rare unless other hypnotic/sedative drugs or alcohol are also taken. The mechanism of action of benzodiazepine include potentiate the inhibitory mechanism of GABA on the receptor. The evidence of benzodiazepine overdose is confirmed with measuring the serum level of benzodiazepine.However it is rarely done in an emergency setting. 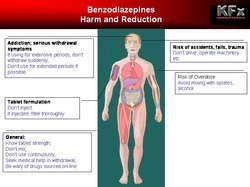 The management of benzodiazepine overdose include, gastric lavage and activated charcoal ( single/repeated overdose) within 1 hour of ingestion. Flumazenil is benzodiazepine competitive receptor antagonist. Flumazenil intake may reduce the requirement for endotracheal intubation as well as avoiding respiratory depression and other central nervous system. Flumazenil is initially given as IV 0.2mg over 30 seconds . Consider giving 0.3 mg if the patient is not responsive. If condition is worst consider giving 0.5 mg flumazenil and repeat the therapy every 30s. The maximum dose of flumazenil require are 3 mg. If after a cumulative dose of 3 mg for 5 minutes and the patient is still unresponsive , then benzodiazepine is not the causative factor of sedation. Due to flumazenil short duration of effect ( 1-3 hr ), additional dose requirement for re sedation is common. In patient who suffer from mix tricyclic antidepressant poisoning and benzodiazepine, flumazenil should be avoided as it may lead to fits.